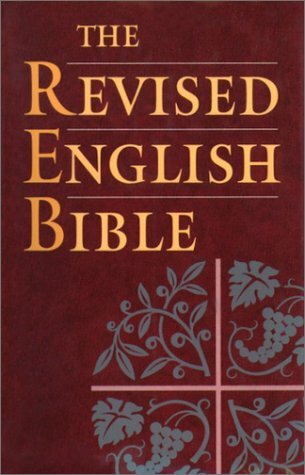 Many thanks to Timothy for allowing me to share a review of the Revised English Bible (REB). Almost two years ago, Rolf (a commenter on this blog) piqued my curiosity with his praise for the REB. I asked questions in the comments and discovered other blog readers who are REB fans. I ordered a used, inexpensive, hardcover REB to check it out. It quickly became my favorite translation, and I have used it as my primary bible for well over a year and a half. I'm excited to share it with all of you. The revisers updated all archaic language to contemporary (“you”) usage, and they quickly realized that this was more than a simple find-and-replace process. Sentences that were originally translated with archaic language contained verbs and language structure that sounded fitting in context, but once the archaic pronouns were updated, the rest of the language seemed mismatched. The revisers attempted to rephrase this language while maintaining translation accuracy. The NEB also contained a number of non-traditional renderings of difficult or uncertain language based on the most recent scholarship at the time which seemed too speculative in hindsight. The revisers updated these accordingly. They further revised British expressions that were unfamiliar to readers in the US. The REB retains occasional words that are unfamiliar in American vocabulary, but they are few and far between. or take his seat in the company of scoffers. or assigned the morning its place? and the stars of the Navigator's Line go out one by one? or walked in the unfathomable deep? Have the portals of death been revealed to you? Have you seen the door-keepers of the place of darkness? Have you comprehended the vast expanse of the world? Compare this with the NABRE's translation. The NABRE preserves a double-negative expression from the Greek (“not without the taking of an oath”), and the subsequent long parenthetical expression and convoluted grammar make it very difficult to parse this sentence without interrupting the flow of reading. The REB sacrifices the double-negative and renders the ideas in much more natural English. Overall, I find the REB to have a flowing, natural turn of phrase with powerful language that surprises me and sheds new light on passages that I've heard countless times. In many ways, it lives up to Msgr. Ronald Knox's ideal of expressing the language of the bible in a way than a native English speaker would. This has been a wonderful review. You have captured many of my own observations of why I enjoy this Bible version (I have owned a copy for some time). The comparisons made especially to the NAB New Testament is one of the reasons there has been a need for revision to it (which is happening as we speak). The REB has a balance of accuracy and cadence that exists in most of the NABRE Old Testament but is missing from the NAB NT. The NAB serves up the New Testament with extreme accuracy, even offering the English reader the very flavor of Koine Greek. But the original-language Greek text is very telling where it was written by amateur writers and not scribes. Pauline texts unfortunately offer up that saint's inability to wax poetic, and the NAB in its attempt to offer accuracy glosses over none of this, even for the sake of readability (compare any Pauline epistle in the NAB with the NRSV and you will see that the NRSV translators kept in mind that English readers were the audience, whereas the NAB is often more precise but written in Greek order). Sentences by Paul can go on for days in The NAB as a result. The REB is designed for the English reader in mind without sacrificing accuracy. It is proof that this can be done, and these reviews have been a wonderful reminder of this. Thank you. Nice post marc, I like the comparison Scriptures you used. As a lector at Mass, I can attest to the difficulty of reading Paul's letters from a formal translation like the NAB! The REB can be refreshing at times! Bonus points for mentioning Msgr. Knox! A very persuasive article for reading the REB. I'm definitely interested. And to shake the ungodly out of it? And set it with the power of speech upon the earth? And crushed the arm of the arrogant? And walked in the tracks of the deep? And did the doorkeepers of Hades quake when they saw you? 18 Have you been instructed in the breadth of the earth under heaven? Tell Me now, what is the extent of it?" "The REB has a balance of accuracy and cadence that exists in most of the NABRE Old Testament but is missing from the NAB NT." Bingo. In my own opinion, the REB has the cadence of any English Bible since the KJV -- and for the modern reader, better cadence. It is a joy to read, both out loud and silently. One important thing to note about the REB is that in many ways, it is a very traditional text. There are entire passages, sometimes rather long ones, especially in the New Testament, that seem to be taken almost verbatim from Tyndale. That is one of the main reasons why the REB is often very beautiful, dignified and poetic. It does have a genius for the flow of English, and encapsulates the power of a good dynamic translation -- it treats English as English, and seeks to render text in a way that does justice both to the original languages and to the receptor language. 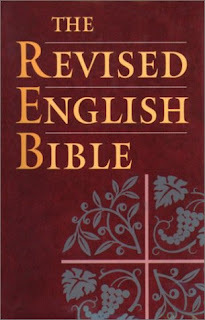 The REB (and is predecessor translations, the New English Bible) are translations that can be read for significant periods of time without stumbling or having to go back and re-read passages to figure out just what the text is trying to convey. Now, there are drawbacks to this approach too -- sometimes the original text is simply difficult to figure out, even if one can read the original language -- and some of the literal meaning of the text is lost (inevitable in any translation though). But in terms of creating a text that can be read and spoken in English, the REB is almost perfect. It has its clunky verses (as every translation does), but relatively few of them. Lest we jump to conclusions from a first blush reading of the REB, there is a big reason it did not take off with every English reader everywhere. True it reads with ease and makes “English read like English,” but if you read long enough the truth is that the REB makes “the Queen’s English read like the Queen’s English.” The REB was interconfessional, yes, just not international. This is what caused it to go mostly unnoticed by the American public. Now don’t get me wrong! It’s a marvelous translation, accurate, scholarly, and yet very British--colloquially so (we're not just talking spellings and punctuation folks). Whereas some Americans might understand these idiomatic expressions and phrases, appreciate them, and even find them delightful, the vast number of them can make the REB somewhat problematic for readers who are not familiar with everyday vernacular exchange in the UK. “A calf unbroken to the yoke” means what? This expression in the REB is simply “an untamed calf” at Ezekiel 31:18 in the NABRE. “This touched them on the raw” in the REB is what the NAB renders as “when they heard this, they were infuriated” at Acts 7:54. The REB indeed reads wonderfully, truly it does. But it was designed to be understood by the average British speaker and regularly renders things in the way they commonly speak. And I could go on to mention many more of these "Brit speak" examples. No, this is not a problem for British readers (and many American ones) and it doesn’t take away from the REB’s masterful scholarship (it even gives it its charm). Just keep in mind that the REB is quite composed of such colloquial phrases, thus be prepared for them if you are unfamiliar with British speech. It might require a little translation of the translation in some instances for some of us. I have decided to show my Cambridge REB a little love. I am tired of the overly stiff morrocco binding on this Bible (feels more like a leather wrapped hardcover) and am sending it to be rebound by abba in black calfskin leather. The book block on this Bible is great, worthy of a rebind! Clunky verses aside, it has always puzzled me that as English-speaking Catholics outside of the United States didn't make greater use of the REB -- English-speaking Catholics who learn British English as a second or third language. Thank you for the kind words everyone! I'm glad so many of you are enjoying the review. It's high time that the REB received some accolades for its excellence! Carl's point about the REB's British English is a good one, and I think it probably is a major contributing factor to why the REB has languished. The US seems to dominate English bible sales, so American translations outperform British ones. On the other hand, I think it's important to emphasize that unfamiliar British expressions in the REB are relatively few and far between. I've scoured the internet looking for reviews of the REB, and I've found comments claiming that the REB is full of British English. It would be easy to come away with the impression that an American reader would be constantly looking up unfamiliar expressions. That hasn't been my experience. I occasionally run into a word or phrase that I don't understand, but it is not by any means often enough to be frustrating. I agree that timing was a huge issue as far as mainstream usage is concerned. But I don't know why it remains an issue when other translations, some relatively obscure globally (like the NLT) are able to get traction while the REB remains in obscurity. As I noted above, when the Indian bishops were looking for a dynamic-equivalence Bible translation to use, they went to the time, effort and expense of modifying the NLT rather than simply pulling the REB off the shelf and using that. And the REB was a translation that had Catholic input. It would have been far easier to fully "Catholicize" the REB (put the books in proper order, fix a few verses here and there to more clearly conform to Catholic liturgical and theological use) and ... we're done. The New Living Translation became popular because it was endorsed by Billy Graham, who even used his 'crusades' to market it. I first learned about the NLT in 1996 shortly after it was published when I turned on the TV and Billy Graham Crusade was on, and there was an ad with a toll-free number where you could call it and get a free copy. I'm pretty sure the cost of that free copy was covered by the Billy Graham Crusade. As for why the Indian bishops went to the NLT rather than the REB, I think the main reason for that is because the language of the NLT is simpler. The NLT is written at about a 6th-grade reading level, and the REB is written at about a 12th-grade reading level. I find it sad and somewhat depressing, but the fact of the matter is to most of the adult population, a 12th-grade reading level is 'too hard' and they complain that they can't understand it. This is why, when translations are revised, they tend to be revised downwards to a lower reading level and lower vocabulary. The RSV was written at a 12th-grade reading level, but the NRSV is written at an 8th-grade reading level. If the NRSV were revised today, the revision would probably be at a 6th-grade reading level. Look at the bestseller list, if books like The Da Vinci Code or 50 Shades of Grey were written at higher than a 4th grade reading level I would be surprised. Pope Francis recently commented about the creation of easy-to-read Bible translations. Upon the release of a new interconfessional translation of the Scriptures released in Italian, the Pope reflected upon his days in Argentina: "The translation of the Bible in colloquial Argentinian did and continues to do a lot of good: it is a good idea because ordinary people can understand it, because the language used is real, it’s the language used by the people, it’s close to the people....We gave it to the people who understood the Bible. It was worth the effort and I’m glad it’s now available in Italian, so people can understand phrases which are not understood if translated literally." When God inspired the Scripture to my people, the Jews, he did not employ language that was at a level most common Jews could not understand. In fact, what was unique about the language used, especially that written in the Torah, is that it was colloquial, everyday speech. This was far different than the speech of Gentile, heathen religions and their documents. Their works were written mainly to be understood by an upper, educated class. Not so the Hebrew Scriptures. Commenting on why such colloquial language was used "The Jewish Study Bible" states in its introduction to Exodus: "Because these laws were presented to the entire people, it became the duty of every Jew, not just an intellectual or clerical elite, to study them." It is the same with the New Testament. Instead of using the Classical or Attic Greek, the authors of the Christian Scriptures used Koine or Common Greek. It is called "Koine" or "Common" because it is the colloquial, easy-to-read, very basic form of the language. The works were written to be understood by the most basic of readers, not the highly educated. Only the work, "To the Hebrews" is written in a very formal address in Greek, but still employs a Koine vocabulary. Now mind you, I don't think we need so many modernized translations on the market, especially those created for the simple sake of being modern. As I mentioned before in an earlier comment on another post, I can read the book "The Wizard of Oz" which was written in 1900, and yes, I can understand it even today in 2017. So that leaves me more than befuddled over the "necessity" to constantly revised Bibles that were originally translated in the 1950s, the 1960s, the '70s, yes, even the 1980s and '90s. There wasn't that much discovered in the Dead Sea Scrolls that changed anything (that discovery had not impact on Jewish critical textual analysis and scholarship, for instance). Still this doesn't mean that all the Bibles we have on hand contain language within is understandable. Some of the terms employed in the KJV were archaic even for 1611, and some of this has come down to most English Bibles of recent times. If the translation employs language that is too hard for the common reader to comprehend, and if the majority of readers need simpler language than what is in the versions on hand, then I agree with the Pope. I also agree with the Torah, that the laws were given to be understood by ALL the people (Exodus 21:1). "Teaching the laws to the entire people is practically unparalleled in the ancient world," says the Jewish Study Bible footnote to this verse. This required a basic vocabulary. And the New Testament writers chose Koine over Classical and Attic for the same reason. The message is not just for those with higher reading levels. The saving word of God is for ALL! Haven't you been assigned to bring God's Word to ALL people? But if the people do not understand you, how can it be said that you are doing justice to your ministry? It is written: "If the trumpet gives a sound that is not clear, how will soldiers know they are being called to battle? And so it goes for you, that unless you speak words people can understand, how will anyone know what you are saying?" --1 Corinthians 14:8-9. "f the translation employs language that is too hard for the common reader to comprehend, and if the majority of readers need simpler language than what is in the versions on hand, then I agree with the Pope. " The problem is that Bible translators and publishers have a very low opinion of the 'what the majority of the people can understand'. When they say that they are going to write something 'in the language of the common people' what they really mean is that they are going to water it down to the lowest common denominator under the assumption that 'the common people' are very, very stupid and need to have everything explained to them. The thing is, the Bible is a very difficult book. It is difficult for any number of reasons, but one of the biggest reasons is that it is a very old book, written in languages that no one completely understands. If you look at the translator's notes in any halfway decent translation of the Bible, you are going to find literally hundreds if not thousands of places where the note says some variation of 'no one has any idea what this passage means all we can do is provide an educated guess'. In the RSV and NRSV, the note says 'meaning of Hebrew uncertain', and this note appears at least once on practically every single page of the RSV and NRSV Old Testament, appearing literally thousands of times. Another reason why the Bible is very difficult to understand is because it comes from a time and place which are largely foreign to us. No matter how much archeological research we may do, we are never really going to completely understand the cultural context of either the Old or New Testaments. So frankly, I think that translations which are aimed at 'making the Bible really simple and easy to understand' (Tyndale's 'plowboy') are doing their readers a disservice. The Bible is NOT an easy book, translations which make it appear to be 'easy' are simply dishonest. If St. Peter himself described Paul's epistles as 'difficult to understand' what right does any translator have to try to make the epistles seem easy to understand? When you try to make the language of the Bible 'simple' and 'easy to understand', the only real way to accomplish this is to try to smooth out all the rough edges, eliminate all the ambiguities, and interpret the Bible for the reader. When the original text is difficult or ambiguous, an honest translation ought to reflect that, and not try to make something difficult look easy simply for the sake of convenience, that is a disservice to the reader. Great point by Biblical Catholic. The Bible is not a simple book to us -- none of us speak Koine as a first language, or ancient Hebrew as a first language. The only Father who learned Hebrew at the feet of people who spoke it as part of a living linguistic tradition was St. Jerome. English is a Germanic language with a grammar & vocabulary that was reworked after centuries of Norman rule -- hence our weird split vocabulary (motherly & maternal, stuff & material, lawyers & attorneys, farmers & agriculturalists, cows & cattle) and our fanatical commitment to word order (subject-verb-object pattern). The Biblical Languages and Latin are a different country for us as a result, even if we weren't dealing with massively different cultures on top of the linguistic differences. Simple English, I think, simply isn't going to be accurate -- even as accuracy is definite within the realm of dynamic equivalence translations. Recall that the Scriptures, especially the New Testament, was written by common people. Acts 4:13 states that Peter and John "were uneducated, common men." And again Scripture states that Jesus thanked God that he had hidden his truths from the worldly wise but revealed them to those who by comparison were "babes." --Matthew 11:25. And 2 Peter 3:15-16 does not say that the Scriptures are hard to understand. Instead these texts are limited to commenting on Paul's epistles, stating that heretics were twisting the more complex statements found within: "Paul...wrote to you, speaking of these things as he does in all his letters. In them [Paul's letters] are some things hard to understand that the ignorant and unstable distort to their own destruction, just as they do the other scriptures." The text doesn't say that Paul's words are hard to translate, ambiguous, or difficult for the common person to understand. On the contrary, the spiritually deficient are those that "distort" their meaning. Creating translations that require a higher education in reading that betrays the original texts doesn't always require "dumbing down" the Word of God or glossing over ambiguity in the text. But it also doesn't mean expecting people to come up to a higher level of reading to benefit from the Bible, and then if they can't to claim that versions they require are "dummed down." That is an insult to people made in the image of God. Just because they cannot comprehend a version of Scripture you find appropriate, you feel you can label what they require as "dumb"? God's image shines brighter in the poor, the disenfranchised, and the "uneducated" like Peter and John than it does in the worldly wise, I promise you that. For those in union with God, even the "hard to understand" Scriptures of Paul are not too difficult to understand, regardless of the reading level of the translation. God's Word is only difficult to those Jesus spoke of when he was asked why he taught using parables. (Matthew 13:10-15) Jesus stated that unless God grants someone the ability to understand his Word, it remains difficult and problematic. Parables cannot be fully understood, truths cannot be grasped. This is not because the Bible is designed to be difficult, requiring scholars and academics to translate and unlock its salvific truths. For as stated above in Matthew 11:25, God reveals his truths to "babes." If the Word is difficult and produces no fruit of love, kindness, and mercy in us it may be because Isaiah's words, as interpreted by Jesus are true of us: "God has blinded them and hardened their hearts, in order that they cannot really see though they have full use of their eyes and this cannot gain understanding that affects their heart in order to really change for the better and be truly healed." (John 13:39-40.) I pray it may never be so of any who truly love the Word, regardless of their level of reading. Cool review, thanks for posting. "I used to think that fidelity to the great tradition of English Bible translating that began with Tyndale, Wycliffe, and the King James Version and continues up through the ESV was a mere matter of literary style; surely theology ought not be beholden to such esthetic concerns? I now think that we receive the Bible as inheritors of a tradition, and that beyond a certain point the concern for translational purity leads us away from scripture to an abstract, disembodied, and a-ecclesial “text. This is the very opposite of the advice often given for making scripture more accessible. “Dynamic equivalency” translations like the Revised English Bible or Eugene Peterson’s The Message are partly motivated by a desire not to sound overly pious or authoritarian, these being traits associated with “biblical” language. The problem with this approach is that it ignores the ways in which the forms of biblical speech are, if not absolutely identical with, nonetheless fitting vehicles for their content. This is why the Bible resists paraphrase. For a thoughtful application of this point to the doctrine of the inspiration of scripture, see David Yeago, “The Bible,” in Knowing the Triune God: The Work of the Spirit in the Practices of the Church, ed. James J. Buckley and David S. Yeago (Grand Rapids: Eerdmans, 2001), 49–94." I'm in general agreement with Carl and Francis here. The Word of God comes thru and can speak to the open hearted believer in many different translations. Let's not make an idol of a translation. With much of the NT especially, a high grade translation that is difficult for ordinary people to understand is contrary to the style and intent of the original Greek. When the US bishops announced their plans for a revision of the NABRE, there was a transcript of their conversations. Along with some joking about how long it would take, and whether the bishops present would be dead or just retired when it was completed, there was a remark by one bishop to the effect that the bible shouldn't be too easy to read, that it should take some work to understand. I tried to find it again online but couldn't. Perhaps someone else knows what I am referring to? The bishop was making a point similar perhaps to the point Mark and Biblical Catholic are trying to make (and contrary to Carl and Francis). To me though it sounded slightly off-key. Obviously we wouldn't want to hear something like The Message at mass (although I think there is even value in paraphrases like that); we don't want to dumb it down to the point of being inaccurate or loses all nuance. But the NABRE OT, and the NRSV (setting aside the inclusive language problems) show that you can be understandable and accurate. Those are formal translations, but bringing this back on point, the REB sounds like a good translation to me. I may pick up a copy. Thanks for the thoughtful review. The Brazos quote from Tom seems to be making a slightly different point: not a conflict between accuracy and accessibility, but between accuracy ("translational purity") and tradition. As a cradle catholic, the KJ is not part of my tradition though. I guess it could be an argument for more traditional, but perhaps less accurate, catholic renderings like "the virgin shall conceive", "full of grace", etc. I use the REB for my daily prayer and study. It by far is my favorite translation of the Bible. The language for the most part is absolutely beautiful. It reveals the meaning of the text as it was written not as some wish it had been written. At times some of the phrases are more British than American in the choice of words but the translators for the most part chose words than sound right in both contexts. Like the Jerusalem Bible, it is my understanding that the REB tried to respect the Septuagint, as the Old Testament was translated. The fact that is Ecumenical is very important to me. You raised some great points, Steve. I think it's true that bible translations can err on the side of too much formal language just as they can err with oversimplification. It might be useful to flesh out the kind of uncertainty that Biblical Catholic referenced. As I understand it, the textual notes saying "Heb Uncertain" could refer to a couple types of uncertainty: First, textual uncertainty: Existing manuscripts may have significantly different readings, leading to uncertainty about what the original authors wrote. Also, a manuscript may have a seemingly nonsensical word or phrase which leads to the suspicion that the original text was corrupted by mistakes in scribal copying. Second, lexical uncertainty: As I understand it, there are many Hebrew words in the Old Testament which only occur once, and they have never been found in any other Hebrew texts. The meaning of these words is uncertain. I think it's perfectly legitimate for a translation to make scholarly decisions about the most likely meaning in these spots and translate accordingly. Proper notes can alert the reader that the meaning is not clear. I wouldn't classify these kinds of decisions as dumbing-down the text. To me, the danger of dumbing-down the text comes from excessive rephrasing to clarify the meaning. But defining "excessive" in that context is almost impossible, and the definition probably varies with what you're trying to accomplish in a translation. Take the example from Hebrews 7:17-24 that I gave in the review. Was it legitimate for the REB to remove the double-negative ("not without the taking of an oath") which exists in the Greek? Double-negatives exist in common English speech. Writers try to avoid them because they are more convoluted and difficult to understand, but I bet they're also more difficult to understand in the original Greek. If the original sounds awkward to a native speaker, shouldn't the translation also sound awkward? The danger with formal translations is that they can make a reasonably intelligible text seem impenetrable or challenging, simply by preserving word order and idioms from the original that are not natural in the target language. On the other hand, dynamic translations often tend toward rewriting the original text to make it excessively clear. Finding the balance between the two is an elusive task, and every individual has a different sense of what the best balance is. No wonder new bible translations often meet heavy criticism! I sometimes feel that when a translation preserves the original word order in a way that is unnatural in the target language, it's verging on being a transliteration and not a translation. I know some Japanese and have done some very informal 'translating'. In many cases if you were to preserve word order you would be saying the opposite thing in English! You are correct, the issue of corrections to the Hebrew is totally orthogonal to the formal vs dynamic debate. In virtually every case where the RSV says "Hebrew uncertain", they translate a different phrase. They don't translate the original Hebrew in those cases. They first substitute a correction into the Hebrew, or perhaps use a Syriac, Greek or other manuscript version, and then translate that into English. And in those cases it's usually very clear English! Formal translations do it, dynamic translations do it, Jerome did it, they all do it. "Creating translations that require a higher education in reading that betrays the original texts doesn't always require "dumbing down" the Word of God or glossing over ambiguity in the text." The standard I used was a 12th-grade reading level. I think a 12th-grade reading level is a bare minimum that should be expected of an adult with a high school, let alone a college, education. Have the American people really become so ignorant and uneducated that the 12th grade is a 'higher education'? I hope not! I find it sad and depressing if it really is true that a 12th-grade reading level is beyond the capacity of the majority of the adult population in the United States. Honestly, if people's reading skills really are so poor that they can't even rise to the demands of a 12th-grade reading level, then it is doubtful that their reading comprehension or retention is good enough that they should be reading books intended for adults at all. If someone cannot read at a 12th-grade reading level, then how can they read classical literature? If someone cannot understand the RSV, then forget about them ever understanding Dickens, Twain, Melville or Tolkein! And don't even bother suggesting that someone read a book by James Joyce or William Faulkner. I bet you think I'm exaggerating when I talk about just how low the reading level required for some modern Bible translation is, but I'm not. Are you familiar with the Contemporary English Version or CEV? Are you familiar with the International Standard Version? Believe me, I am not exaggerating when I say that these translations are shockingly immature, I have no doubt that I could go to the 'Young Adult' section of any library and find a book with a higher reading level than the CEV. Charlotte's Web, The Isle of the Blue Dolphins, The Bridge to Terabithia. These books are commonly read by 3rd and 4th graders, and yet I have no doubt that each of them is written at a higher reading level than the CEV, a translation which is commonly read by college educated adults. Something is wrong here. Let me give you an example of what I object to here. In the books of Samuel in the Old Testament, a literal translation of the passage where David dies would be something like 'and then David rested with his fathers', a variation of this phrase appears in the NASB, the RSV, NRSV, the ESV, and the NAB. 'David rested with his fathers' is a beautiful phrase, it suggests continuity, that David is merely one in a long line of Jewish kings, in a long lineage that traces the centuries, it suggests immortality, that David in some sense 'lives on' even though he is dead, it suggests dignity and it is a simple, poetic phrase that I think any person over the age of about 10 understands. What is the purpose of that? There is 'simple language' and then there is talking down to the reader and being condescending. And that is what I think that translation is, it is condescending. What exactly is wrong with 'David rested with his fathers'? Do the translators have any evidence that people don't understand what this phrase means, or are they just operating from the assumption that their readers aren't very intelligent and that they need to spell everything out explicitly because their readers don't 'get' subtlety? In my experience, when you have high expectations of people, people are usually able to meet those expectations. Thanks for your comment, I see where you are coming from now. I agree "slept with his fathers" is much better! If necessary they could add note saying "dude, this means David kicked the bucket, bit the dust, he's pushing up daisies - the dude is deeeeaaad!" This is a case where translating idioms instead of paraphrasing makes sense IMHO. It's not incorrect to say "David died", but "slept with his fathers" captures more nuance. It's not a matter of vocabulary or reading level either - in both cases the words are simple. This verse is one of the reason why I use the RSV over the NRSV. I much prefer the literal reading over the NRSV's "slept with his ancestors". It's much more earthy, personal and touching to say "with his fathers." Having said all that, do we really want to say "If you can't read the RSV, go pound sand!"? My beloved RSV has been my primary reading bible for the last 5 years. I have notes pencilled all over it. Some of my notes are alternate readings from the NRSV or other translations that are clearer to me. And trust me, my reading level is way above the 12th grade level. There are passages in the RSV that can be translated more clearly, without loss of accuracy. Sometimes the RSV is difficult simply because it is beholden to the KJ phrasing. If the KJ resonates with you, that's great. Recently however I have switched to the NABRE for the OT, as I think it as at least as accurate and more clear. Finally, how bad is "he died" anyway? It's not inaccurate. If a simpler translation speaks to people, who are we to say "don't read it!" As Billy Graham once said, the best translation is the one you read. There is nothing wrong with either translation of VAYISHKAV IM AVOTAV. While it literally translates "lay with fathers" as in "he will" or you will "lay with your fathers," as the Jewish Biblical Quarterly will point out if you look this up in any one of their scholarly articles, it is an idiomatic euphemism for saying "he died." But it is an idiom, not a poetic term. The idiom does not refer to death but to traditional Jewish eschatology that someone has assuredly inherited their place in "HaOlam haBa" or "the World to Come." The word "lie" in this idiomatic term means to recline, with the same root word found in the English rendition of "sit" found in Micah 4:4 where each Jew is promised to "sit under their own vine and under their own fig tree" in HaOlam haBa. The same basic word is also prayed daily in the Shema at Deuteronomy 6:7 where we are told to recite Torah when we "lie down and get up." The expression to "lie down with your fathers" is related to another euphemism for death in Hebrew: "He was gathered to his people." This idiom means that the person is living life with his family in the World to Come, gathered together with them and enjoying their company. So, yes, I agree that it is wonderful to leave the idiomatic expressions as they are as they have a very rich meaning to them. You have no argument with me there. However, the idiom is a euphemism for saying that someone has died, and while people get that when the idiom is rendered directly, what happens next is usually a mistake. Having asked others what they think these idioms means, most people reading the terms "lay with his fathers" or "gathered to his people" in English think it means to be buried and rest in death with or as one's ancestors have been. That demonstrates the problem with translations in general that sometimes happens. Something gets lost. Here many non-Jewish readers project their own ideas on top of these expressions, never knowing the cultural meaning of the terms and its connection to Micah 4:4 and Olam haBa. These terms have these very specific intentions in Hebrew speech that get glossed over either way, whether you render it literally or simplify it. So I am not in favor of either rendition unless a footnote explains the actual meaning of the term to keep English readers from projecting a mistaken understanding upon the original intended meaning of the expression. So then, does that mean that "David lounged with his fathers"... Or perhaps he "leaned back & kicked up his feet with" them? In my native language, yeah. At least back then in those days. It's sort of like the English euphemism about dying: "Your grandfather has passed." In English we understand this idiomatic expression. But to translate that into Biblical Hebrew would mean something like: "Your grandfather has gone across your face" or "he crossed your path." If translated via formal equivalence it could also be understood as "your grandfather has walked over you" or even "your grandfather has alienated you." Yeah, it sounds funny, but figures of speech unique to a language and/or culture (otherwise known as "idioms") don't survive the translation process very well. The expression we are talking about means "David has gone to recline (under his vine and fig tree) with his ancestors," kind of as you put it in colloquial terms; as in David lived a life so faithful that it assures him a resurrection among the other faithful. While it doesn't imply that David is in heaven (as there was no such concept in Jewry then), it does speak of David and faithful Jews as nevertheless so guaranteed a place in the World to Come that they are spoken of as already there.